When it comes to matters culinary, Russians show their internationalism, shedding any and all nativist tendencies—just as they shed their shoes when entering a friend’s home. The fact that current relations with some former republics of the Soviet Union are less than cordial, has little or no bearing on the Russian appetite for Uzbek plov, Georgian khinkali, Estonian herring, or Crimean champagne. Classic Russian cuisine is not known for spices and exotic flavors, but over centuries, Russians have very successfully incorporated both the flavors and cooking techniques of their near neighbors into their own cooking through the import of signature dishes. The happy result for cooks and gourmands is that the pungent spices of Central Asia, and the musky, nutty flavors of the Caucasus are as ubiquitous as the thick sour cream and salted pickles of Russia. 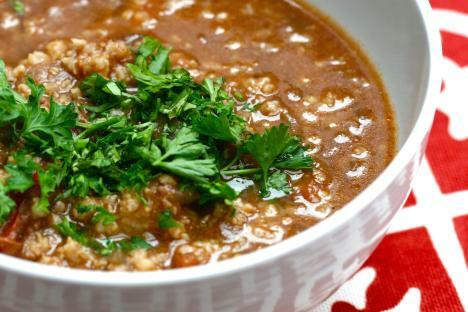 Kharcho, a hearty and savory meat and tomato soup that almost qualifies as a stew, is a perfect example of a dish that is celebrated far beyond the borders of its native Georgia. In Russia, kharcho is as much a staple of the workplace canteen as it is a fixture on an upscale restaurant menu, or a midweek favorite of a three-generation family. I’m particularly fond of it in winter, since nothing else quite warms you up like a hot bowl of kharcho after a day of trudging through the snow. For every cook, there is a different kharcho recipe. There isn’t much agreement on the basic foundation ingredients: some say lamb, others insist on beef. The rice faction refuses to even discuss the merits of the more traditional millet or what one culinary historian argues is the original starch component: dried bread softened in yogurt. One thing is certain, however: kharcho gets its signature tangy sweet and sour layer of flavor from dried fruits. In Russia, this is sold as “plum paper” – thick sticky sheets of dried fruit skin, or its companion “apricot leather.” Acceptable substitutes include prunes, apricots, and pomegranate juice and tamarind rind. I use all four to get the right flavor. If you plug for millet (my hands-down choice) try cooking it separately and then adding it into the soup just before serving. That way, the millet will not absorb all of the moisture and turn the soup into porridge. Be sure to have lots of fresh coriander, parsley, mint and dill for a generous garnish. Finally, kharcho is one of those dishes that taste even better the next day, and better still on the day after that. So, go ahead, make a lot! 2. Moisten the tamarind rind in 60 ml (1/4 cup) of hot water and set aside. 3. Heat the oil in a heavy-bottomed soup pot or Dutch oven. While the oil is heating up, dry the lamb/beef mixture with paper towels, season with salt and pepper. 5. Reduce the heat to medium, and add the onions and garlic. Stirring frequently, sweat the onions until they are translucent and golden. 6. Add the tomatoes and the tomato paste and stir to combine the ingredients. 7. Add the stock, spices, and walnuts, reduce heat and let simmer. 8. Pour off all but 15 ml (1 Tbl) of the water moistening the prunes, place them in a food processor fitted with the steel blade and pulse until the prunes are reduced to a jelly-like consistency. Add to the simmering soup. 9. Add the tamarind rind to the pot, cover, reduce heat and simmer for 45 minutes. 10. While the soup is cooking, prepare the millet. Toast the millet in the vegetable or olive oil until it becomes shiny and a few grains “pop.” Add the remaining 500 ml (2 cups) of water to the pot. Cover and reduce heat until the millet has absorbed all of the water (15-20 minutes). 11. When soup has simmered for 45 minutes, add the lemon juice and the pomegranate juice. Taste and correct seasoning with salt and pepper. 12. To serve, warm deep soup plates in the oven. Place a heap of millet in the center of the plate, and then pour the kharcho over it. Garnish with fresh herbs.